It only took a moment, This could happen to YOU. Old2cvman... stopping by'e with another Historic memory...... I built this Red Devil, in the early 1980s... from a scrapper I bought cheap.....another vehicle to my abundance fleet, of 2 C.V. variants that a used at weekend events, I ran this for approx five years.... before she sadly died. in a quick Cremation Ceremony. I was driving home from work one evening, and the Petrol delivery pipe up to the Carburetor, slipped of its mounting and pumped fuel onto a red hot manifold, the underside of my Bonnet was lined with 2 inch thick noise eliminating Wadding, which caught fire instantly... in 6 seconds of braking and jumping out the Car to save my Life... she was gone.... before you ask..... Oh Yes I had a Commercial Heavy duty extinguisher under the passenger seat... it was a senario of Run for your Life. Re: It only took a moment, This could happen to YOU. 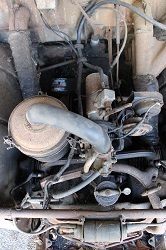 old2cvman a écrit : the Petrol delivery pipe up to the Carburetor, slipped of its mounting . The solution is call "serflex"
PS : you seem had a rich life ! Always buy an extinguisher ? Ask your passenger to watch after de fuel pipe ? Not of all, today's lesson is : fuel pipe end must be strongly tight Serflex or Colson band. I put your story in the right section ! As David (Zamzam) said, you had (have !!!) a very busy life ! ...............mais il était bercer comment? ce garçon? Why died ? Ready for re-building and for a new life ! A Boot Lid Box.... for quick shopping spree. 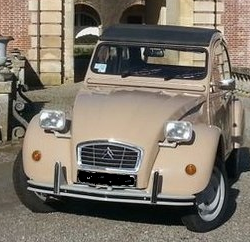 Thank You ..member Vinss789..... for your encouraging lovely comment, all my postings, are aimed as enjoyable experiences, that I have encountered in 60 years of CV..ing , sharing with other lovers of Citroen 2 C.V. vehicles , is what all my Stories are all about.... no other motive ..... I am glad you like my input to this wonderful site...... Mister Administator ???? Here is a little original Boot Lid Box I manufactured, my first attempt from Two Washing machine Lids,, and a little ingenuity.... as time passed , a more modified version , which I made from a thrown away Refrigerator.... the Spare wheel showing is decoration.... but it does bring the character to life too. and it hold more daily findings.... for my forth coming projects. During the last War... My City of Liverpool was pounded nightly by German Bombers,from 1939 until mid 1943 ,,then it became Flying Bombs sent from the French coast cities, untill 1944 the Invasion of Europe. As As a young Boy aged eight, and my next brother aged 10 we daily rummaged throughout Bombed properties, and salvaged anything that was us full in those Hard Times....my other Three siblings served in the services, One in North Africa, with the Eighth Army, One in the European theatre of War, and one in the Far East. This knowledge has never left my mind, thats why I have some many talents at manufacturing any thing I need in Life.... its a Challenge thats in stilled in ME...a good code of practice. that pays big dividends, if your enterprising. My vehicles are always modified, improvisation gives them the Kiss of Long Life... this is 52 years young...any one with loads of Money can purchase new panels and parts, but my approach is re manufacture your self every thing you need, this way experience teaches you knowledge and skills, I have just re strengthened all my rear under the Boot Chassis, with steel fit for a Battle Ship, and the Chassis Edged with Angle Iron.... its therapeutic experience, and stimulates my BRAIN and my ABILITIES to improve on things. 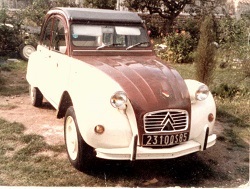 Re: Citroen 2 C.V. s are habitual, they crave attention . Hello all readers.... Old2cvman... stopping bye,its been some time since I contributed some dialogue to these pages... for those who remember my posts, I under went life saving surgery, on March 19th, after the beloved Dream Car of my life, dropped of the Jack, onto my Left Shoulder and neck area, which resulted in a Neck Dissection Parotidectomy...an Eleven hours event in Surgery. At 86 years young... this is quite an ordeal.... but I over came this and bounced back very gradually. At this time my Citroen was almost like me... a basket case, but I eventually got it back in shape, and sued my city council.. which I was awarded £ 400...for Road Pot holes under body damage. She has been running fine, for several months now, as too have myself, with various occupational projects, mainly my front Garden modification, See just a couple of pictures attached. However a few weeks ago, whilst out driving, my Steering arm linkage to the Hub came adrift, left hand side, ( My vehicle is a Left Hand drive ) I had just made a right turn on a main junction, 7 a.m. Sunday morning, and was starting to accelerate , suddenly the left wheel turned complete left, and the car raised nose dived onto the Sidewalk.. and collapsed.. I was four miles from home, after inspection, I cut the near side safety belt, and fabricated it to bandage the axle arm, in a forward rolling position, and with numerous endeavors steering the vehicle I got the vehicle home.....which took best part of an hour to do. I have since rebuilt from my spares stock pile,another N.Side axle beam, and Hub assembly, I modified the King Pin fitting thru the Axle beam, drilling the beam out with a 17 mm drill, and subsequently fitting King Pin bushes in the Beam as well as the Swivel Hub mounting. So there is still life in this old Jalopy which I have ran and modified since I acquired 53 years ago, it will still run from Liverpool England , down to Monte Carlo, France a distance of 1362 miles in Thirty one hours none stop .. I used to do it from time to time, to the Cannes Film Festival . But thats another Story Folks. J'ai déplacé ton message pour le mettre à la suite de tes mésaventures. Old2cvman once again.... THANKING EVERYONE for there kind responses to my POSTS. Hello.... I know its difficult, corresponding on a European site , but our common bonds, is Our affection for Citroen 2 C.V. vehicles..... sharing pieces of knowledge, with dedicated readers, is a great motivation.... and subject matters can expand to many other facilitates as we all know. A point of interest brought this forward , many moons ago, when we chatted and displayed interests in Motor Cycles we have individually owned. Once a door is opened, who knows what can transpire..... thats what lifes all about . I have two Internet site, that I administrate on Face Book, which cover Old Hollywood Stars, I have been a movie buff since my infancy... and I pursued this Dream all my working Life, as a Long Distance Truck Driver, Paparattzi Photographer, which took me for dozens of trips to north America, in search of the Un -reachable Stars . And like the Man of La Mancha ....... I reached my Goal. I did this for 50 years in total, and I became friends with Hollywood's finest actors. My exploits are on YOU TUBE ... in Star interviews... for those interested in such matters search under Barry Iddon Star Interviews . P.S. This isn't a plug for any reason, its just every day conversation topicality.